A freelance writer from California now living in Brisbane, Australia. I have a BA in Communications specialising in writing, that I do not get to use often enough. You will find a Gluten Free and Child-Friendly theme throughout my articles. 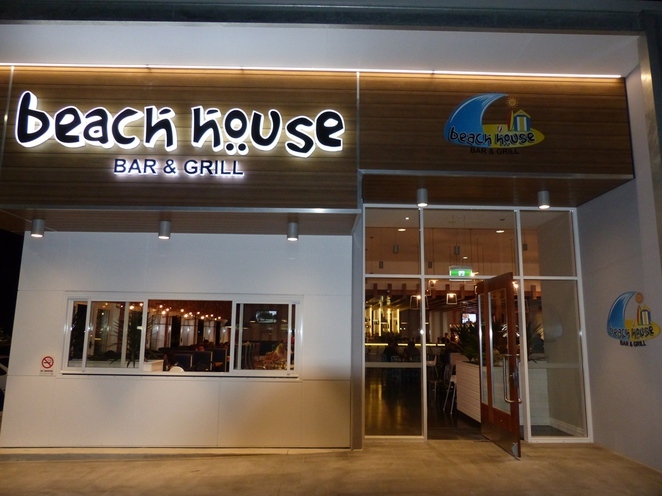 When you first walk into The Beach House Bar and Grill in Browns Plains you wonder how such a quirky restaurant has landed itself in good ole Browns Plains. This restaurant is part of a chain. I've been to one of the other locations which is a bit more up market and in Mount Gravatt Garden City, however, that's not to say this Beach House is not on par in its own way. Having lived in and around Logan since moving here 6 years ago I can definitely say this is a vast improvement over the typical fish and chips, pizza and pub food usually on offer (nothing wrong with any of those, but when you want something different…). Don't get me wrong there are little gems hidden everywhere in this area but you do need to learn to look. The look and feel of The Beach House is simple but funky with several feature walls, one of which was covered in potted plants. They were fake but still had a fun feel. The metal geometric frames hanging from the lights gave the place a modern and trendy touch. The front wall opens up into a nice open air seating which would be great for summer nights or breezy afternoon lunch. Although I will say they had this seating closed off, I'm assuming this was because they didn't want to clean this area on a weeknight, but still ,it would have been nice to sit in such a beautiful space. The staff are friendly and helpful. The main waiter is a peppy little fella and tends to sing and dance around throughout the night, which I find refreshing but others might not like during their meal. Needless to say, I am very impressed with what they have done with the place. As for the food, we decided to do a shared meal but we ordered way more than we needed because the portions are huge. Our already nibbled on starter. Simple but yummy. It was all delish and well presented, but the real gem was the buffalo wings. I haven't had real american style buffalo flavoured wings very often since moving to Australia and I was blown away to find the perfect flavour at this place. They took my taste-buds all the way home to the USA. You should know that they did not come with blue cheese dressing which is the norm in the states, but we are not in the states so I won't be a snotty American and complain about that. Just for those that like blue cheese, don't expect it there. All in all it was a fantastic meal and the bar has a great selection. We will definitely go back again with our son since it is very airy and kid friendly. I apologise for the already eaten food shots; we were starving so I forgot to take photos before diving in. The presentation really was nice. The chips look fluffy and crisp. I like how they are presented. Can't beat newspaper. Good review Sally. I was in the US when buffalo wings just started "flying". We were on a special deal with Hyatt hotels and found ourselves in Buffalo. Even more unusual we found ourselves in a Sports Bar and they were serving, you guessed it, Buffalo Wings. They were extraordinary with lots of blue cheese sauce (dressing). I have never tasted buffalo wings like them. Also about the Beach House Bar & Grill. Looks OK from the website. One major problem, for me at least, they don't list the prices of the cocktails. Grrrrr.. If you're after bargain buffalo wings deal.Beach House @ Garden City Mount Gravatt have deal every Thursday night $5 for 10 wings.